A convenient, fast and affordable alternative to concrete. No need to carry heavy concrete bags. Fast Post Anchor is an award-winning innovation. It’s more efficient and convenient than concrete for setting fence posts, mailboxes, signs and much more. Because of its expanding nature, a 600g bag of Fast Post Anchor replaces up to 1 x 40kg bags of concrete mix. 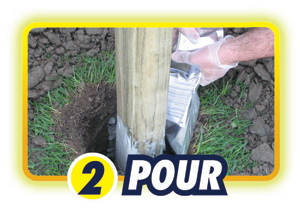 Fast Post Anchor does not require water, sets posts in minutes and becomes waterproof after fully cured which helps protect the post against rotting and corrosion. 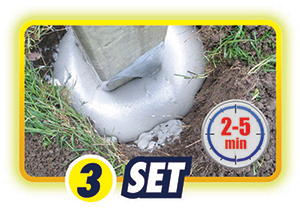 Fast Post Anchor is a two-part proprietary polymer that expands to fill the peripheral void between a fence post and the hole. It expands immediately after mixing and holds the posts in 2-5 minutes. Fences can be built in 15-30 minutes after Fast Post Anchor finishes expanding. Sports Posts and Poles such as Basketball, Soccer, Volleyball and Tennis. Fast Post Anchor can also be used to anchor some items into the ground or into holes drilled in concrete. 1 x 600g bag of Fast Post Anchor replaces 1 x 40kg bags of ready mix concrete. For example: a 75-100mm post can be set with a 1x 600g bag of Fast Post Anchor in a 15cm wide hole that is 600mm in depth. No more 400 x 400mm wide holes required. Expands to set the post in minutes. Waterproof. Helps protect the post against rotting. Can be used during the winter. Fast Post Anchor is available in a convenient 367 ml (600 gram) dual sachet. If there is a slight gap between the top of the expanded foam and the ground level, the hole can then be topped up with dirt for landscaping purposes. One 600g bag has enough material to set a 75mm x 100mm pole into a 15cm x 60cm deep hole. Fast Post Anchor has a shelf life of 24 months from date of manufacture. Although there have been no changes in properties of Fast Post Anchor bags after 30 days at -15°C, we cannot guarantee the performance of the product if bags have not been protected from freezing. It is also important to keep in mind that bags must be acclimatized at 22°C – 25°C for at least 2 hours before using them. For more detailed installation instructions, contact a Royal Adhesive Sales Representative. Using a soft cloth and mineral spirits, carefully remove any Fast Post Anchor smudges from surfaces of the post that are visible above the ground as well from tools before Fast Post Anchor dries. After Fast Post Anchor dries, it can only be removed by cutting it with a handsaw or a utility knife for example. Be careful as this may damage the post surface. 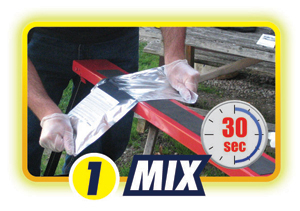 Mix for 25-30 seconds immediately after release of the safety clip. Do not mix the Fast Post Anchor for longer than 25-30 seconds once the safety clip has been released. Once mixed, immediately cut the corner of the bag and begin pouring into the post hole. If the bag is not cut immediately after mixing, the product will begin to react inside the bag and will rupture. Do not leave the product in a hot closed vehicle.